• Whisk together olive oil, vinegar, salt and pepper. • Add peppers and marinate for 1 hour. • Fill each pepper with a piece of mozzarella. 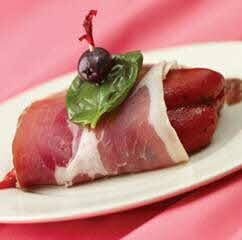 • Wrap a slice of prosciutto around each pepper. • Top each with a basil leaf and olive, held together with a toothpick.